I want to select a country. I want to insert a stock. JStock is displaying list of stocks with same name. I cannot find XYZ stock. How can I view stock history? I wish to be informed when stock's price hits certain level. I want to receive stock alert from my company email. JStock is taking up too much network bandwidth! There are no network connection. Stock price are not updating. Is there any short-cut to move the chart's yellow info box around? I realize list of stocks suggested by JStock is not up-to-date. Go to JStock top menu Country, and select your desired country. There are total 26 countries being supported at this moment. At the center of Stock Watchlist page, there is a text field. To add a watched stock, just simply enter the prefix stock symbol or stock code, and press ENTER. The intelligent stock search system will prompt you for a list of stock selection. This happens when your country is having multiple stock exchanges. They might be having multiple stocks with same name. To avoid confusion, go to Options-> Options...-> GUI. Select Display 2 columns stock info. After that, you will be getting the following stock list. Enter your desired stock in the text field. JStock will prompt you with a list of suggestion. (Optional) If you are not happy with the symbol suggested by JStock, you may double click on it and change it. (Optional) If you know the stock code, says 5199WA.KL, just key in "5199WA.KL" in the text field and press enter. Right click on any stock. Select History... with following icon . Key in your desired stock price under Fall Below and Rise Above columns. Fall Below - If stock's last price is lower or equal to this value, you will receive alert. Rise Above - If stock's last price is higher or equal to this value, you will receive alert. Remember to select your preferred alert method through Options-> Options...-> Alert. Go to Options-> Options...-> Alert. You must have a free GMail account to receive stock alert through email. However, we do support any email address too. You may enter any optional email address under CC Copy field. By default, JStock's stock price scanning speed is 5 seconds. In order to save up your network bandwidth, you may adjust this to higher value, says 60 minutes. Go to Options-> Options...-> Speed. Adjust it to 60 minutes. With higher value, scanning speed will become slower. With slower the scanning speed, JStock will less frequent contact stock server. As a result, it will consume lesser network bandwidth. Whenever you wish to refresh to most updated stock prices immediately, just go to Edit-> Refresh Stock Prices. Or, you may just use Ctrl + R keyboard shortcut to refresh stock prices immediately. High chance that you are behind a company network. Try the following. Go to Options-> Options...-> Network, look for the following buttons. Click on Test connection. Does it give you any hint? Click on Auto detect proxy. If it does suggest you a new proxy server, click OK. Does it help? Restart JStock. Does it work now? Besides using mouse, you may also use left/right arrow key. 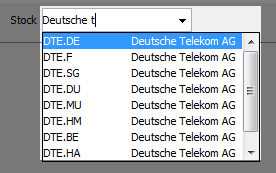 Try to double click on the network icon to see whether we can get the latest stock database. We hide it by default. You may make it visible through Options-> Options...-> GUI. Tick on Show intraday chart.